This coming Sunday (August 2nd) sees the 3rd Annual Nor-Con sci-fi and comics festival in Norwich, Norfolk, and I’ll be in attendance for the second year running. There’s a host of guests, including former Transformers (and current Spider-Man) artist Barry Kitson, the sixth Doctor Who Colin Baker and Peri, Nicola Bryant (I’ll be getting both to sign my copy of The World Shapers, which contains both the Sixth Doctor strips I wrote), Robert Llewellyn (Kryten from Red Dwarf), Shane Rimmer and more. I’ll have a fixed spot at the convention, from where I’ll be selling signed original scripts and comics, as well as the last few ultra-rare script/comic packs for Transformers: Regeneration One #80.5. For more information on Nor-Con, check out their website here. 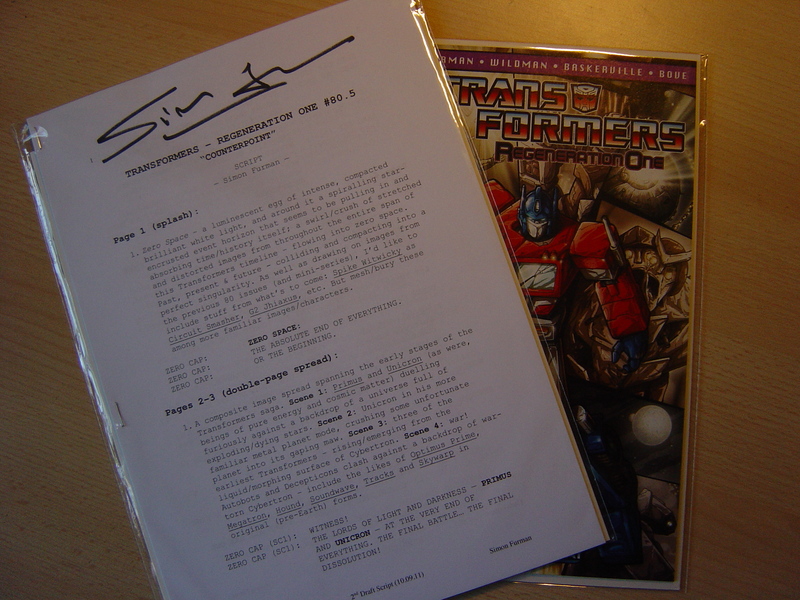 With the convention season drawing to close (though there are still one definite and one potential date to go), I’ve made available (over on ebay) my current clutch of signed/original [facsimile] scripts, including the exclusive script/comic pack for Transformers: Regeneration One #80.5 (of which only a very few remain) and the script for this year’s Auto Assembly Voice Actor Play (voiced by Paul Eiding, Michael Bell, Townsend Coleman and others). You can find all the listings here. I’m off to Auto Assembly today, the UK’s (nay, Europe’s) biggest Transformers convention. The event starts later today and runs over Saturday and Sunday (May 4th and 5th), and features a host of guests (including 3 US voice actors: Michael Bell, Paul Eiding and Townsend Coleman), over 700 attendees (to date) and dealers galore. I’ll be there, along with fellow Regeneration One co-conspirators Andrew Wildman, Stephen Baskerville and John-Paul Bove, plus the likes of Nick Roche, James Roberts and even a rare appearance by the one and only Jeff Anderson!! There will be panels, Q&As, signing sessions, a live audio play (on the Saturday night), Cosplay and more! As usual, I’ll have signed comics, scripts and more with me, and a permanent pitch in the main hall, so you can come find me at your leisure. I also have a few of my exclusive Transformers: Regeneration One #80.5 script/comic packs still remaining, but grab ’em quick. They’re only available this year, never to be repeated, and going fast! Look forward to seeing you there! For more details of AA 2012, check out their website here! You are currently browsing the simon furman blog archives for August, 2012.